Kim Harker and Taylor Pinzone look to attack. 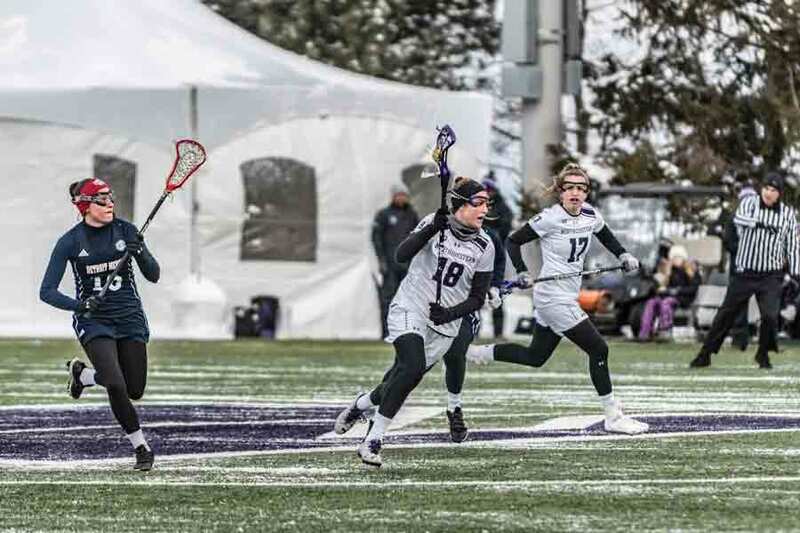 The Northwestern attack lit up Colorado for 15 goals before falling at Duke. Northwestern split a pair of ranked contests this past week, taking down No. 19 Colorado 15-8 at Martin Stadium before falling 9-8 to No. 18 Duke on the road. The No. 9 Wildcats (3-1) came out on fire Thursday against the Buffaloes, taking an 11-1 lead early in the second half as junior attacker Selena Lasota racked up a hat trick. Colorado, however, would not go quietly into the mid-afternoon fog. The visitors scored 6 straight goals of their own to cut the deficit to 4 with just over 15 minutes remaining. NU held off that second half surge, however, and pulled out a 15-8 victory. In the circle, however, the Cats clearly missed senior attacker Shelby Fredericks. Colorado won 14 draw controls to NU’s 11 — a statistic that likely would’ve been much different with Fredericks out there, as the senior set the program record for draw controls in 2017 and ranked third in the country in draw controls per game. Those struggles in the circle came back to bite the Cats in the matchup against Duke on Sunday. The Blue Devils controlled seven of nine draws in the first half and jumped out to a 6-2 lead on the scoreboard heading into the break. NU stormed back with three straight goals from Lasota, freshman midfielder Ally Palermo and senior midfielder Sheila Nesselbush to cut the deficit to one with midway through the second half. Lasota’s attacking skill and Palermo’s game-breaking speed helped turn the tide for the Cats. After allowing another goal, Lasota completed her hat trick, junior attacker Claire Quinn scored her fourth goal of the year and NU and Duke were all square at 7-all with 12 minutes to go. But Duke’s Grace Fallon scored the next one, and then Charlotte North completed her own hat trick to put the Blue Devils up 9-7. Despite a late goal from senior attacker Nicole Beardsley, the Cats couldn’t overcome that deficit, flying home with their first loss of the year.